Whatever your reasons are for relocating to a new area, the process can feel overwhelming. Whether you’re moving across town or across the country, you’ll be changing more than your address. Besides a new house, you may also be searching for new jobs, schools, doctors, restaurants, stores, service providers and more. Of course you’ll need to pack, make moving arrangements, and possibly sell your old home. With so much to do, you may be wondering: Where do I start? In this guide, we outline seven steps to help you get prepared, get organized, and get settled in your new community. Our hope is to alleviate the hassle of relocating—so you can focus on the exciting adventure ahead! If you’re unfamiliar with your new area, start by doing some research.1 Look for data on average housing prices, demographics, school rankings and crime statistics. Search for maps that illustrate local geography, landmarks, public transportation routes and major interstates. If you’re moving across the country, research climate and seasonal weather patterns. Check out local newspapers and blogs for information on political issues and developments that could impact your new community. You may also want to search for online forums and Facebook Groups relevant to your new area. These can be a great place to find information, ask questions and just observe local attitudes and outlooks. If you’re relocating for a job, find out if your new employer offers any relocation assistance. Many large corporations have a designated human resources professional to assist employees with relocation efforts, while others may contract this service out to a third party. Some employers will also cover all or a portion of your relocation and moving costs. By gathering this information up front, you’ll be better prepared to make informed decisions down the road. Once you’ve sufficiently researched your new area, you can start to identify your ideal neighborhoods. The first step is to prioritize your “needs” and “wants.” Consider factors such as budget; commute time; quality of schools; crime rate; walkability; access to public transportation; proximity to restaurants, shopping, and place of worship; and neighborhood vibe. If possible, visit the area in person to get a feel for the community. If you’re comfortable, strike up conversations with local residents and ask about their experiences living in the area. Still not sure which neighborhood is the best fit for you and your family? Contact a local real estate agent for expert assistance. It’s usually the most efficient and effective way to narrow down your options. Once you’ve narrowed down your list of preferred neighborhoods, it’s time to start looking for a home. If you haven’t already contacted a real estate agent, now is the time. They can search for current property listings that meet your needs, typically at no cost to you. Create another list of “needs” and “wants,” but this time for your new home. Include your basic requirements for square footage, bedrooms and bathrooms, but also think about what other factors are important to you and your family. An updated kitchen? A large backyard? Double sinks in the master bathroom? Narrow your list down to your top 10 and prioritize them in order of importance.2 This will give you a good starting point to begin your home search. Unless you have an unlimited budget, don’t expect to find a home with everything on your list. But having a prioritized list can help you (and your agent) understand which home features are the most important, and which ones you may be willing to sacrifice. If you already own a home, you’ll also need to start the process of selling it or renting it out. A real estate agent can help you evaluate your options based on current market conditions. He or she can also give you an idea of how much equity you have in your current home so you know how much you can afford to spend on your new one. Your agent can also advise you on how to time your sale and purchase. While some buyers are able to qualify for and cover the costs of two concurrent mortgages, many are not. There are a number of options available, and a skilled agent can help you determine the best course given your circumstances. To make the unpacking process easier, be sure to label the top and sides of boxes with helpful information, including contents, room, and any special instructions. Keep a master inventory list so you can refer back to it if something goes missing. If you plan to drive to your new home, map out the route. And, if necessary, make arrangements for overnight accommodations along the way. If driving is not a good option, you may need to have your vehicles transported and make travel arrangements for you, your family and your pets. Lastly, if you will be leaving friends or family behind, schedule final get-togethers before your departure. The last days before moving can be incredibly hectic, so make sure you block off some time in advance for proper goodbyes. To make your transition go smoothly, prepare for your arrival well before moving day. Depending on how long your belongings will take to arrive, you may need to arrange for temporary hotel accommodations. If you plan to move in directly, pack an “essentials box” with everything you’ll need for the first couple of nights in your new home, such as toiletries, toilet paper, towels, linens, pajamas, cell phone chargers, snacks, pet food and a change of clothes.7 This will keep you from searching through boxes after an exhausting day of moving. Arrange in advance for your utilities to be turned on, especially essentials like water, electricity and gas. (And while you’re at it, schedule a shut-off date for your current utilities.) Update your address on all accounts and subscriptions and arrange to have your mail forwarded through the postal service. If you have children, register them for their new school or daycare and arrange for the transfer of any necessary records. You may want to have the house professionally cleaned before moving in. And if you plan to remodel, paint or install new flooring, it’s easier to have it done before you bring in all of your belongings.8 However, it’s not always feasible without someone you trust locally who can supervise. Another option is to keep a portion of your things in storage while you complete some of these projects. If there are no window treatments, you may need to install some (or at least put up temporary privacy film), especially in bedrooms and bathrooms. And if appliances are missing, consider purchasing them ahead of time and arranging for delivery and installation shortly after you arrive. Just be sure to check measurements and installation instructions carefully so you aren’t stuck with an appliance that doesn’t fit or that requires costly modifications to your new home. If you own a car, check the requirements for a driver’s license and vehicle registration in your new area and contact your insurance company to update your policy.8 If you will rely on public transportation, research options and schedules. While staring at an endless pile of boxes can feel daunting, you should take advantage of this opportunity to make a fresh start. By creating a plan ahead of time, you can ensure your new house is thoughtfully laid out and well organized. As you unpack, make a list of items that need to be purchased so you’re not making multiple trips to the store. Also, start a list of needed repairs and installations. If you have a home warranty, find out what’s covered and the process for filing a service order. Although you may be eager to get everything unpacked, it’s important to take occasional breaks. Have some fun, relax and explore your new hometown! Combat feelings of isolation by making an effort to meet people in your new community. Find a local interest group, take a class, join a place of worship or volunteer for a cause. Don’t wait for friends to come knocking on your door. Instead, go out and find them. Finally, be a good neighbor. Make an effort to introduce yourself to your new neighbors, invite them over for coffee or dinner, and offer assistance when they need it. Once you’ve developed friendships and a support system within your new neighborhood, it will truly start to feel like home. 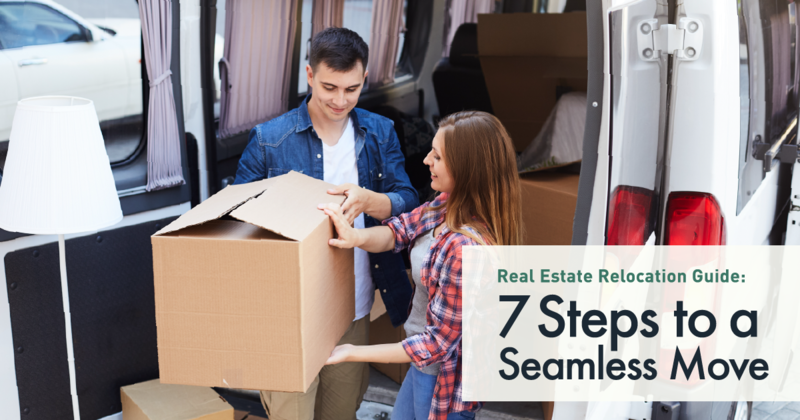 While moving is never easy, these seven steps offer an action plan to get you started on your new adventure. To avoid getting overwhelmed, focus on one step at a time. And don’t hesitate to ask for help! In a 2015 study, 61 percent of participants ranked moving at the top of their stress list, above divorce and starting a new job.13 But with a little preparation—and the right team of professionals to assist you—it is possible to have a positive relocation experience. We specialize in assisting home buyers and sellers with a seamless and “less-stress” relocation. Along with our referral network of movers, handymen, housekeepers, decorators, contractors and other service providers, we can help take the hassle and headache out of your upcoming move. Give us a call or message us to schedule a free, no-obligation consultation!